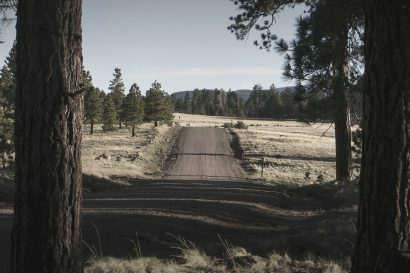 Editor’s Note: This article was originally published in Overland Journal magazine in 2012, and as a result, reflects the future tense. Expeditions 7 was completed in 2014, successfully completing the goal of taking the same vehicle to all seven continents. Every significant endeavor shares the same humble beginning—the spark of an idea. How that idea grows and thrives is based upon our collection of experiences, and our ability to act on the minutiae that form the foundation of any worthwhile pursuit. Success is a collective: a framework of ideas, the input of a team, and a well (deep or shallow) of past performances and learning. Expeditions 7 must be approached in the same manner as any complex endeavor, by breaking apart every component into hard-won, yet achievable, milestones. 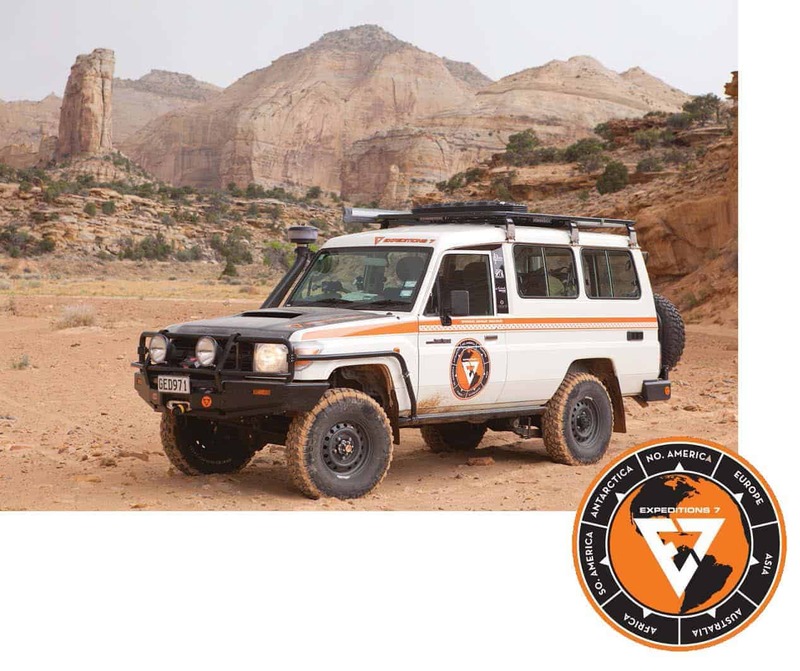 My partner in this endeavor and the expedition underwriter, Greg Miller, CEO of Greg Miller Toyota and the Land Cruiser Heritage Museum (among other ventures), had a personal goal: to drive a Land Cruiser around the world. I shared the around-the-world goal, and planned to do it by motorcycle in early 2012. Combining our ambitions, along with Greg’s love for the Land Cruiser brand, would allow both of us to achieve a result that would be far more difficult if pursued independently. As we began specifying vehicle requirements, we agreed the 78 Series would be the most appropriate model: for both the metric-ton capacity and generous interior volume. Throughout the planning process, Greg used the yardstick of “optimal” to put a framework around each decision point. “Optimal” defined the crossroads between expense and performance. This was combined with my goal of keeping the vehicles simple, practical, and fully functional, while remaining under the maximum payload. 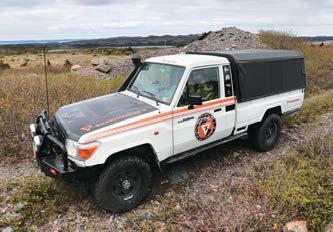 The Expeditions 7 trucks, their modifications, and kit are the result of 8 months of meticulous planning and hard work. Deciding which vehicle to drive around the world was actually pretty easy, especially for Greg. 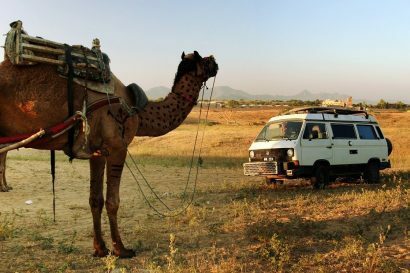 Without a doubt, there are several base vehicles appropriate for round-the-world adventures, but few have the reputation for the reliability and durability of the 70 Series Land Cruisers. Within the 70 Series lineup, the most utilitarian of the fleet is the 78 Troop Carrier, or “Troopie,” a high-roof three-door with a full metric-ton payload capacity. This model offers enormous interior volume, and the security of glass and sheet metal surrounding the occupants and cargo. 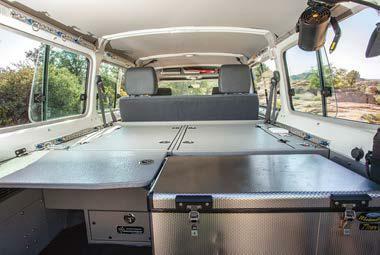 It also serves in most of the world as an ambulance, backcountry taxi, or UN/NGO transport. Greg and his team worked closely with Toyota in Japan to specify the vehicles’ features, which included the fitment of a 1VDFTV turbo-diesel V8 and a 5-speed manual transmission. Additional options included front and rear electronic locking differentials, air conditioning, and a raised air intake. I have no doubt that many of Overland Journal’s U.S. subscribers are asking, “How does one get two 78 Land Cruisers into the U.S.?” The short answer is “only temporarily,” as we have a temporary importation permit and an EPA variance. This was obtained at considerable effort, and a huge “congratulations” goes to Greg and his team for the accomplishment. The trucks are registered and titled to a New Zealand corporation, which allowed Greg to buy the vehicles in Oceania and subsequently drive them in other countries (under a letter of authorization and carnet). 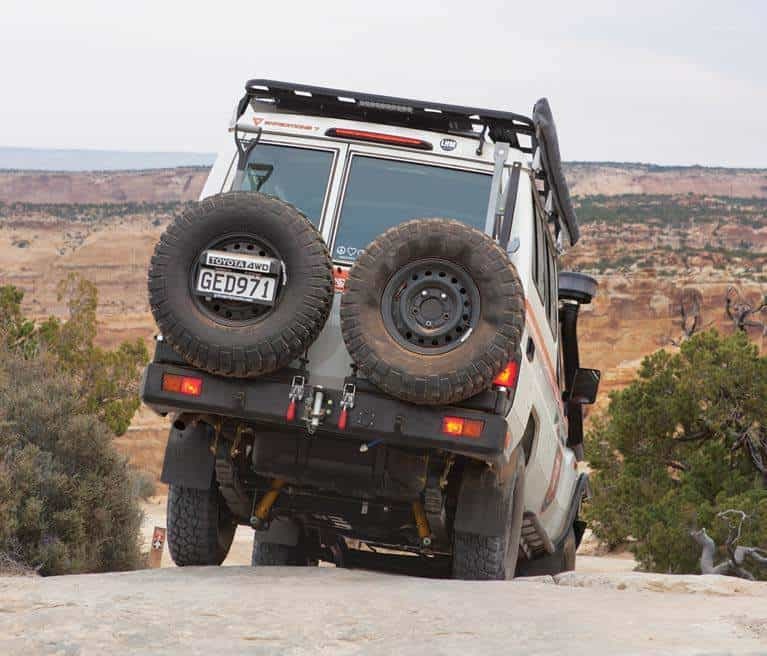 A 70 Series Land Cruiser does not require many modifications to complete a worldwide adventure. However, we did have a few requirements for trail performance and passenger comfort that resulted in the following modifications. With the goal of sleeping mostly in the trucks, we worked with Mario Donovan of AT Overland on a fully integrated storage and habitation system. We needed to retain use of the folding rear seat for minders and additional passengers, thus the main storage area is aft of the rear seat. This includes a 13-gallon (50-liter) National Luna fridge, 20-gallon (75-liter) water tank, storage lockers, and a storage drawer. Next to the fridge is a “mud room” of sorts, with a panel that flips up and holds its position with friction hinges. When the rear seat is folded forward, a hinged panel locks into place, providing a nearly 7-foot sleeping surface the width of a double bed. Storage is generous, and with our minimal equipment list, we still have sufficient room for dry food stowage. In the sleeping configuration, we roll out Nemo Cosmo Pads with the Pillowtop sleeve. For sleeping bags, we alternate between Nemo’s 0°F units and their -30°F units, depending on conditions. As a unique solution to keeping the cabin warm, I specified an Espar hydronic unit that pumps heated glycol through three systems. 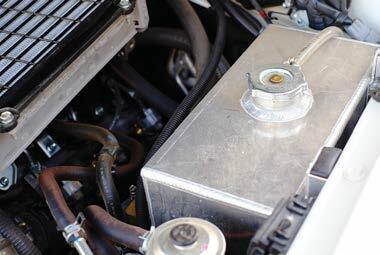 The first system functions as a pre-heater for the motor, channeling 90°F (30°C) glycol through the engine block. The second loop, at 180°F (80°C), is for the hot water shower. The final loop is through the factory heater core in the dash, at 190°F (90°C). 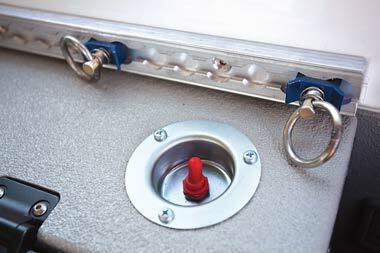 We then wired 12-volt power to the blower motor from the auxiliary battery, allowing for a heated cabin throughout the night in frigid regions. All are managed via mechanical thermostatic valves. This system has proven extremely effective. So much so that we recently had to leave a window open a few inches while camped above the Arctic Circle at -35°F (-37°C). 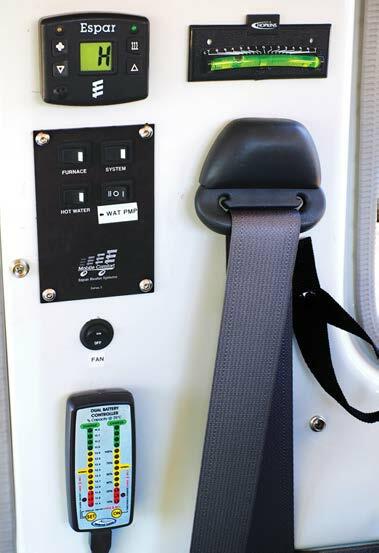 For 12-volt power, AT installed an additional AGM battery and National Luna dual-battery controller. 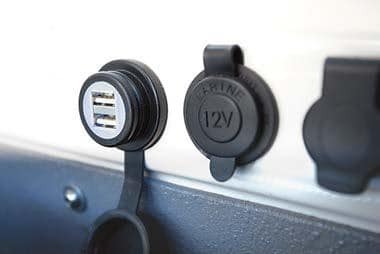 Several marine-grade 12-volt outlets are installed in the dash and rear storage compartment, along with a unique 2-amp, 5-volt USB outlet for charging devices such as an iPad. 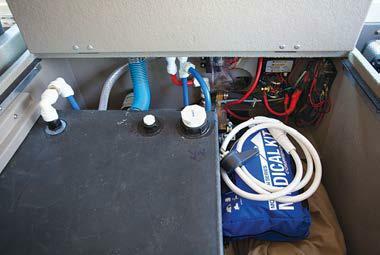 A 2,000-watt pure sine wave inverter supplies 120-volt power. The entire system is fused, and isolated from the factory Toyota wiring harness. 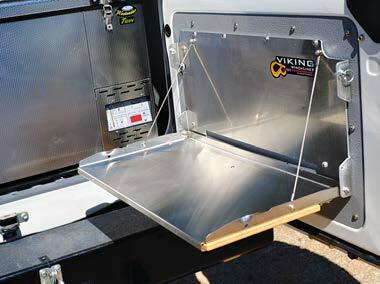 For camp systems, we specified a Partner Steel stove that mounts to the rear door opening or can be used on our Front Runner table. A 5-gallon (20-liter) propane tank was mounted between the chassis rails. An entire Snow Peak kitchen kit (for up to eight) stores in a Red Oxx chuck box bag and fits just inside the mud room. For lighting, four Hella LED reading lamps were installed. 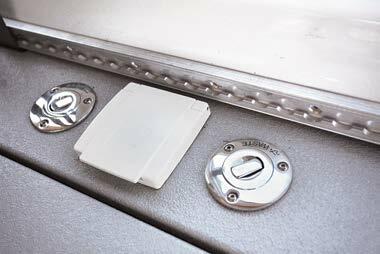 Each can switch between red or white light, and can be used in camp, while sleeping, or to support the navigator while driving. 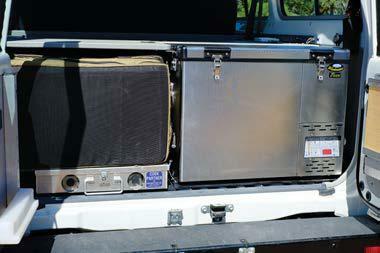 For inclement weather, or the heat of the Simpson Desert, both vehicles have 25-square-foot (2.4-meter²) ARB awnings mounted to Eezi-Awn low-profile aluminum racks. Proffitt’s Cruisers in Salt Lake City, Utah. are Bruce Dorn and Sinuhe Xavier. Despite what many Land Cruiser owners would like to believe, a 78 struggles on the trail in stock form, even with differential locks. To address articulation, tire performance, and protection, we called upon Proffitt’s Cruisers in Salt Lake City, Utah. We started with an Old Man Emu heavy-duty suspension and their new Sport shocks, which corrected for rear sag and increased chassis clearance by nearly 2 inches (5 cm). The firmer shocks helped reduce sway and provide better control in the compression cycle. To increase total ground clearance and improve traction on the dirt, we installed 255/85 R16 BFGoodrich KM2 mud tires on factory steel wheels. Two matching spares were mounted to a custom rear bumper. For protection from animal strikes and the wilds of urban jungles, we utilized an ARB front bull bar and custom rocker panel protection, integrated with connecting front fender bars. While these items do add weight, they also greatly improve the chances of completing the trip with minimal (or no) damage. 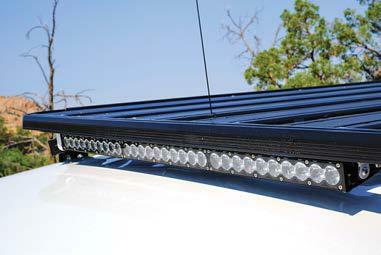 For storing temporary roof loads, we installed Eezi-Awn’s new low-profile aluminum roof rack. To the rack we mounted a Front Runner stainless steel table and over 60 inches (150 cm) of LED lighting from Baja Designs. 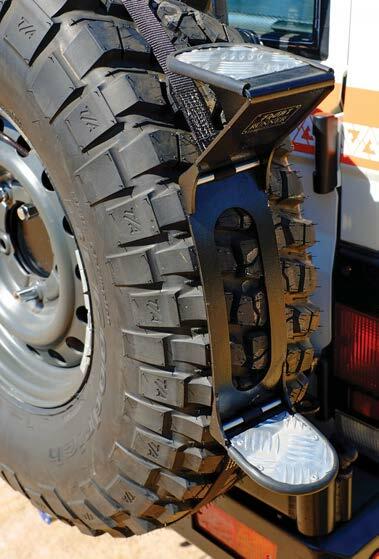 To address self-recovery, we added four Max- Trax sand tracks and a complete selection of Viking recovery equipment. 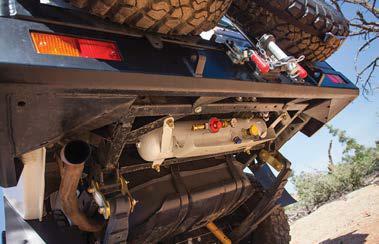 Tucked into the front bumper of each vehicle is a Warn 9.5xp with 80 feet (24 m) of synthetic winch line. Proffitt’s also attended to a medley of other details ranging from iPhone stereo systems to custom overhead consoles. The work Proffitt’s performed is absolutely world-class. 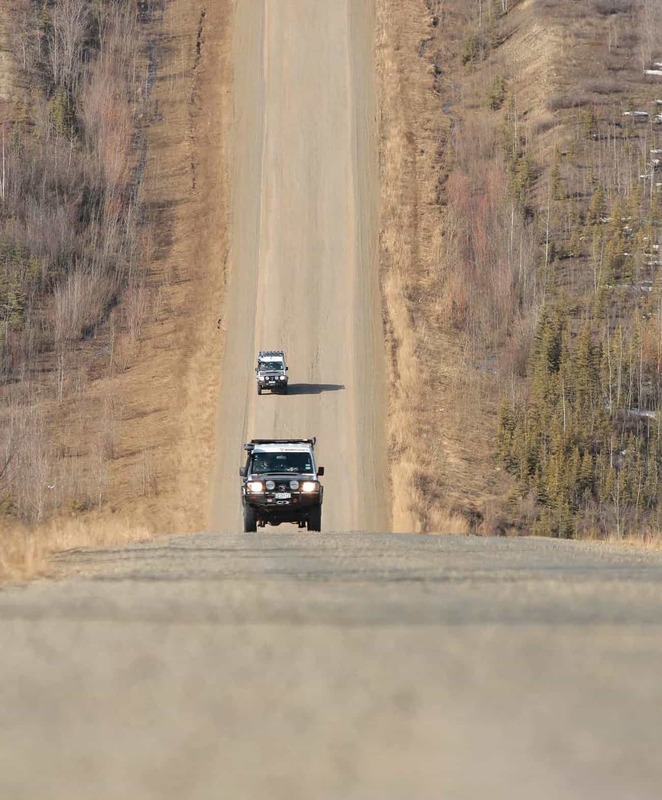 As I write this article, our team has completed the North American segment, traveling over 7,000 miles (11,000 km) from Prudhoe Bay, Alaska, to the Overland Expo in Arizona, and then to Cape Spear, Newfoundland. The vehicles operated well, with only a 12-volt socket that stopped working (fixed by plugging in the wires), and a faulty control panel on one of the National Luna fridges. We also made a change to the suspension, reducing the height of the front springs by about 1 inch (2.5 cm) to regain some caster and stability. My most notable complaint about the vehicle is the poor road handling and general tendency for the front end to wander at high speed. Though this is most evident at interstate speeds in the U.S., an emergency lane change at any speed gives me concern. We have some ideas to improve this, including increasing the track width of the rear axle and possibly increasing the rebound shock damping. The V8 diesel motors are a pleasure to drive, pulling the nearly 7,000-pound (3,180 kg) trucks down the road effortlessly. With this performance comes some compromise, as fuel economy has fared worse than hoped, averaging only 15 mpg (16l/100km) on the North American segment. This will likely improve as the motors break in and speeds drop in other countries. We are particularly pleased with the sleeping configuration, which is both comfortable and efficient. With two occupants in the truck, I can climb in and be asleep in about 1 minute. 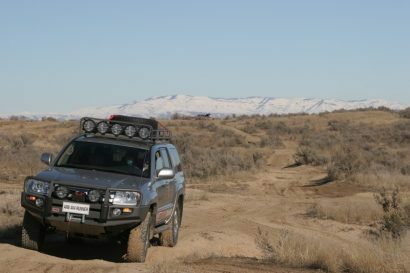 Overall, the Land Cruisers have performed as expected, are competent in technical terrain, and comfortable. As the team gears up for Europe and Asia, and the completion of driving through the Northern Hemisphere, we are confident that our vehicles and equipment are up to the task. What began as a casual conversation between friends, that “spark of an idea,” has, through focus, dedication, and hard work, transformed into the overland trek of a lifetime. 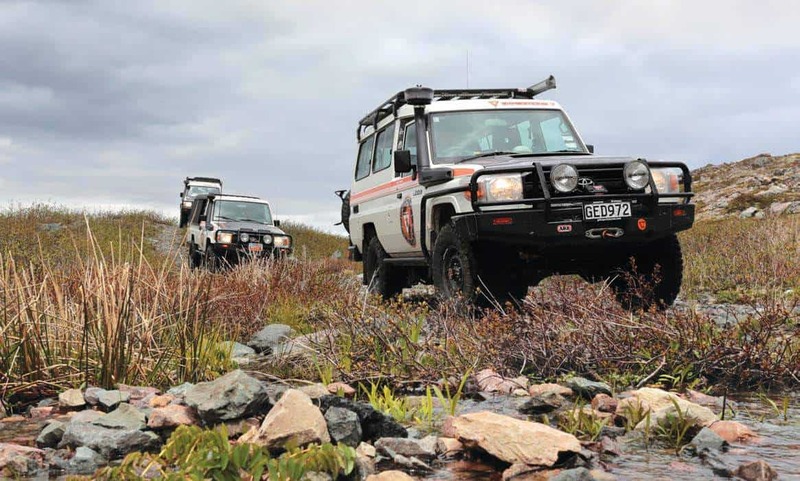 The vehicles can be seen in the Land Cruiser Heritage Museum and more of the trip can be viewed on expeditions7.com . Head to Head: Motocycle vs. Truck Travel, Which is Best?